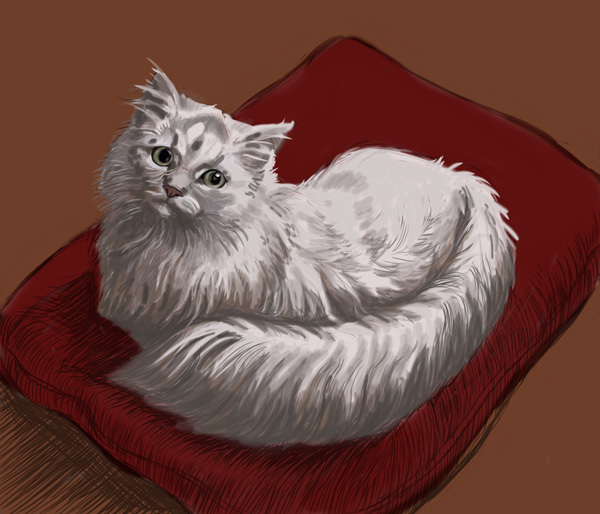 And here is the final digital painting printed on canvas wrap. I'll soon be posting photos of a new commission I'm working on of a Samoyed-collie mix. Well, this one took a little longer than expected, circumstances not withstanding but she's finally finished. The client is happy and I'm looking forward to my next project. Before getting too involved in the details, I've laid in some flat colour with which to show the client. I've added the pillow colour and flooring on different layers so that I can make quick changes should the need arise. 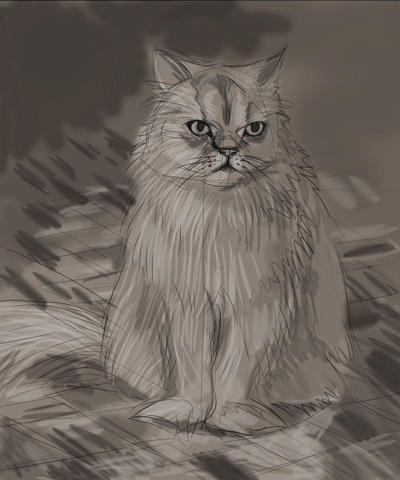 I've completed inking the piece digitally and have submitted it to the client to ensure she's happy with the likeness. I could also have prepared this traditionally in pencil but I often find it more efficient to do this in Photoshop because I can add another layer underneath to show where the bones sit. 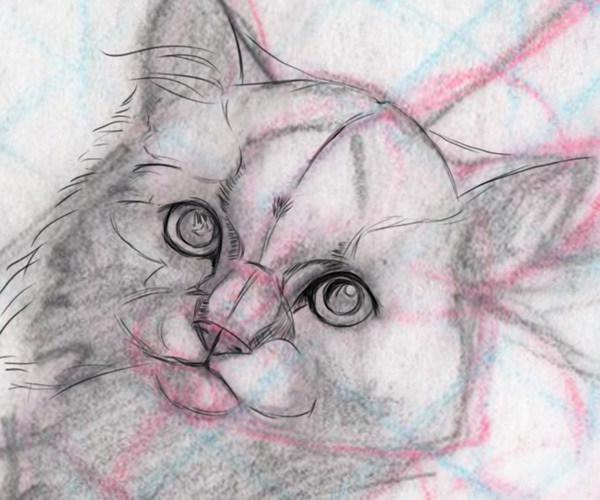 This helps me to see any obvious errors in the pose and to see how the fur will sit. 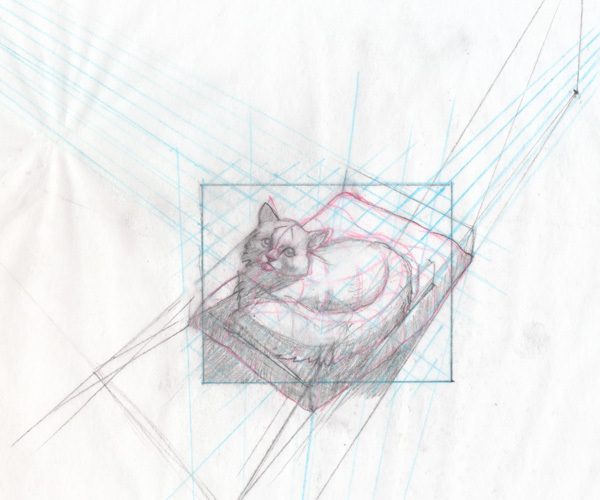 Once happy with the layout, I outline the cat and bed in pencil and add some light shading. At this point, I scan it in and bring it into Photoshop for inking which I do on a separate layer above the scanned image. 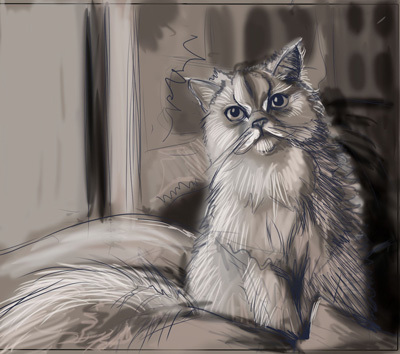 Now that I've moved and my office is less of a disaster zone, I thought I'd attach some thumbnails I completed for my friend's pet portrait commission. It's been on hold for a while for various reasons but I will now be resuming and plan to post pics of the progression.